Ka’iulani of Princeville is a luxury condominium development of 77 attached homes located on Queen Emma’s Bluff in Princeville, Kauai, Hawaii. 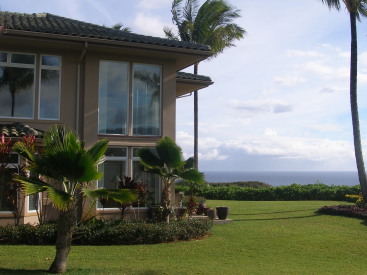 Ka’iulani #31 is located at the bluff end of the development and offers fabulous ocean views. This beautiful townhome has 2864 square feet and is offered fully furnished with exquisite furnishings and numerous upgrades and additional finishing details. You can enjoy incredible ocean views and the Anini Reef. The home offers 3 bedrooms (two are master suites) and three and one half bathrooms. The soaring ceilings in the main living area, upscale details and finishes throughout and a two-story family room that opens to a very private lanai and ocean views makes this a fabulous home to own. The kitchen has a Sub-zero stainless steel refrigerator and Wolf stainless steel oven, Wolf gas cook top and Fisher Paykell dishwasher and a built-in wine cooler. Slab granite countertops and custom Aristocratic Upgrades include a built-in buffet in the dining room with a granite counter top and built-in upper cabinets. Crown Molding throughout with upper indirect lighting. Upper custom cabinets were added in all the bathrooms for extra storage. Additional features include: Designer Chandeliers Designer Ceiling Fans and Sconces Closet Organizers Hunter Douglas Silhouette and Luminette Blinds Built-in Shelving and work bench in the Garage Upper storage above the Garage with a fold down ladder for access Security System Custom Shower doors in Master Bath Wall Safe and Floor Safe Slider Screen Door to the Courtyard Tiled Courtyard with Potted Plants Custom Wood Railing top on entry Half wall Shelving in Lower Storage Area The amenities are the best that Princeville, Kauai, Hawaii has to offer: Three heated pools, spa, barbeque area, a lighted walking path and a resident manager.